It's my blog now. Over two weeks of Pete-only postings! I celebrate with some awesome smarty-pants pro-bicycle propaganda. Auspicious tidings on this totally-non-arbitrary-day-of-recognizing-cyclic-and-or-orbital-motions-of-our-pertinent-planetary-bodies! And that we share ways of noticing our recognitions! As the totally-eclipsed moon was washed red with an atmospheric glow not unlike that of a just-ignited Yule log, I hope we all stayed as awake as necessary for what was surely one of the most special events on a Cold Solstice since 1638 (and until 2094). I was recalling last night, as I laid on the beach and stared up at that much-more-spherical-seeming-when-it-isn't-doing-its-mirror-thing heavenly body, that I spent a fair amount of the last lunar eclipse also just sort of checking it out. I actually wrote a poem about the last one (with a title that went something like "On Viewing the Last Total Lunar Eclipse Until 2010" (which probably seemed further away at the time), that was mostly about apophasis, which was at the forefront of my thinking in those days (part of the broader & on-going negativism of my poetics/worldview)). That poem got whittled down and eventually just called "Apophasis," but then got whittled down to where it's just a couple chunks of moon-imagery that are waiting for other poems to show up in (one chunk did, not so long ago, tho I can't quite recall it at this moment). In the usual kind of nerdy misappraisal of other peoples' behaviors, when I stepped outside last night to start watching the eclipse, at about 1:45am, I was expecting the streets, the park, the beach to be crowded with other people also out to stare at the moon (I seem to recall moon-viewing in a decent crowd at Franklin Elementary for some eclipse of yore, so maybe that established a false precedent for the popularity of lunar eclipses (especially on the solstice, come on!)). But it wasn't all that crowded. I've been living on the Beach for a couple days now, so it's odd to see people still out at their bars and clubs at 2am and not stopping whatever they're doing to go stare at the sky for a while. I headed to the beach for viewing, wondering, as usual, about why I already knew I was going to end up blogging about this, and whether or not this compulsion to share is problematic or not, or even a compulsion, etc. And also, like, watching the moon slowly lose its light. Mostly: when it's totally eclipsed, the moon is a rock in the sky. And: when a totally eclipsed moon is blocked by a passing cloud, the rock in the sky is gone. Douglas Hofstadter has a new book coming out in March. Exciting! I probably haven't been this excited about a book coming out since the last time Hofstadter had a book coming out (a book we blogged about pretty well, way back then). Here's a list that makes Miami seem less crappy to live in then, say, Pittsburgh. It's, of course, not surprising that Pittsburgh would be pretty high up on the cancer-chemicals-in-your-water list (and I would guess that it varies pretty significantly depending on where exactly the water was sourced from). Generally speaking, I would guess that Pittsburgh is pretty high up on most gonna-poison-you lists. I'm not sure if it's still the case, but I'm pretty sure the ol' hometown at least used to be host to the largest number of Superfund sites in the country. Gulf Stream isn't my literary magazine anymore (that is, I'm not it's Editor anymore), but its newest issue is online. So congrats to David, the current Editor! A new web designer, James, has taken over, so this will probably be the last issue that reflects the work that I did in making Gulf Stream an online journal in the first place. And in an even more important note, I'm extremely proud of how large Gulf Stream's staff has grown (if you go back to Issue #2, and then check #3 and then #4, you'll see that it's gotten larger every semester), which really says a lot for the work that we've done in the last three years to make Gulf Stream an important part of FIU's MFA program again. Enjoy! Random Act of Culture & Patti Smith from Knight Foundation on Vimeo. 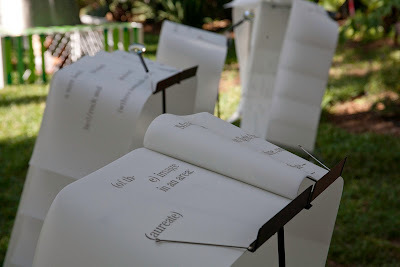 These are three photos of our collaborative book project that Carol took and posted on Facebook, so I think they're safe to share here as well. It is called Idiopa(g)ean: a brok(op)en page-song. The books present a fractured poetic text with many possible ways of being read, intended to be interpreted aloud into a complete whole be each reader or group of readers that encounter it. 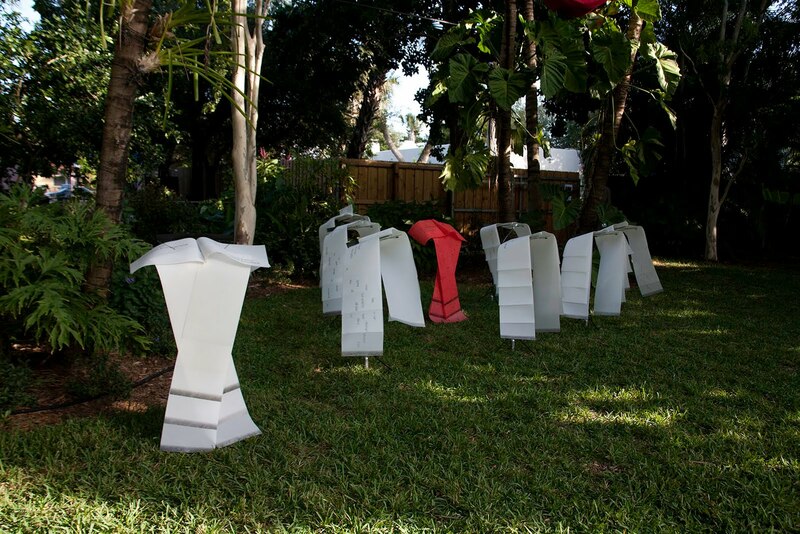 Carol's guiding image for the design of the books was of a flock of ibis strolling through a South Floridian lawn, joined by an exotic scarlet ibis. I decided, two-thirds of the way through making it, that my poem, to me, was about love conquering capitalism, or vice versa. when they were whipped up by the wind. That's a (tired, oblivious) me sunning in the background. "Aureate" is my fourth or fifth favorite "a" word. 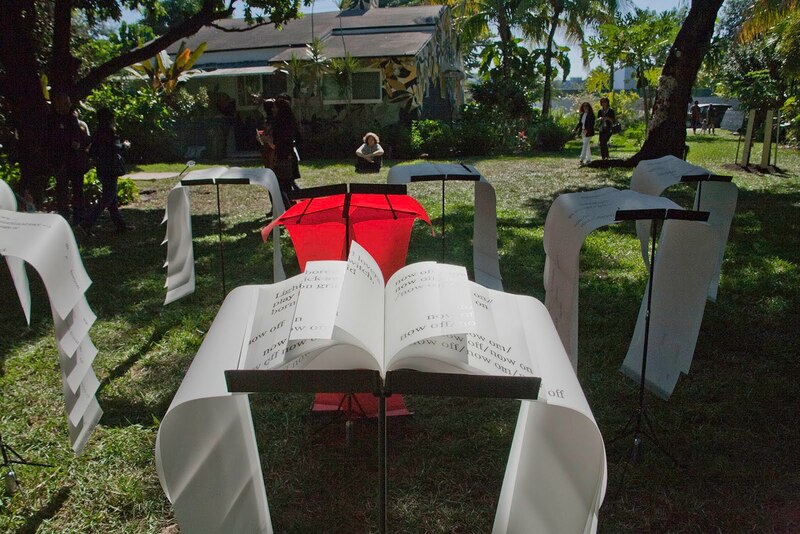 Carol Todaro and I had a collaborative poetry-based installation on display at CasaLin during Art Basel Miami (for the second year in a row (this is what part of last year's looked like, if you've forgotten)) from Thursday through Sunday. It's a long poem written by me printed across eight books designed and hand-made by Carol (hand-printed (transferred) by both of us). 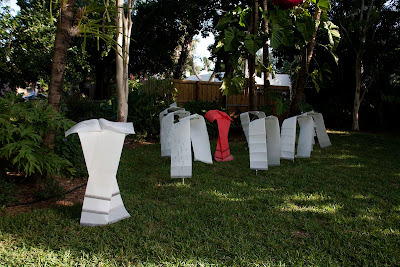 Here's a blog that has a couple pictures of it, amongst the other pieces in the show with us. Once I get some more pictures of it, I'll post them or share them somehow. But for now, that was the week that was. No game stories online as of this typing, but: unbelievable, instant-classic football game. I haven't seen that amount of violence in a non-fictional football game before -- scarily so, in the shot to Heath Miller's head, sometimes just graphic as in the close-ups of what was happening to Roethlisberger's nose -- but just intense, well played on both sides, the big stars making huge plays. Polamalu gets a lifetime achievement award in haunting Joe Flacco's dreams with that karate-chop forced fumble in the fourth quarter, adding to his C.V. from the '08 season AFC Championship. Just unbelievable. That game doesn't usually happen in real life.